Canadian tech startups now have 106 incubators and accelerators to choose from but they shouldn’t lose sight of what the programs are really designed for, a venture capital panel warned in Toronto on Thursday. While the jump in support services is a positive thing for Canadian startups, it might make fledgling firms forget what their ultimate goal is: to build a viable tech business, not just to get accepted or graduate from an incubator or accelerator, said panelist Rick Segal, co-founder and CEO of Fixmo Inc., a mobile risk management (MRM) solutions firm based in Toronto. “The idea of all these programs is to accelerate your business. Going through one of these programs to say you went through one of these programs is stupidity,” Segal told a roundtable held by the CanadianVenture Capital Association (CVCA). 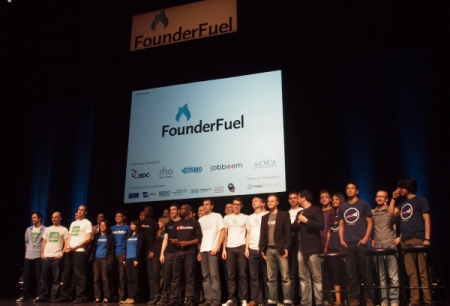 Demo day for startups atFounderFuel, one of the accelerators launched recently in Canada. Tech incubators typically provide startup firms with office space, business equipment and services, and a supportive peer environment alongside other startups without a set deadline to leave the facility. Accelerators can include some or all of those things but only within the framework of three or four months, plus initial equity capital, mentoring and an intensive product or business development program leading to a demo day. The past two years alone have seen the launch of Hyperdrive, INcubes, Extreme Startups, and MaRS’ Jolt. The accelerator trend was touched off by the 2005 creation of California’s Y Combinator accelerator (its graduates include Dropbox and Reddit) and the 2007 launch of the TechStars accelerator in Boulder, Colorado. While Segal proclaimed Canada is enjoying “a golden age of startups and VC,” the sudden proliferation of incubators and accelerators had him riffing on the potential cons of so many programs springing up so quickly. One danger is what Segal dubbed “badge” syndrome, where startup founders boast about which incubator or accelerator they’ve gone through rather than the company they’re building. “I’m passionately against this nonsense that (someone) says ‘Oh, you went to Y Combinator’ and writes you a big cheque. It’s ridiculous,” said Segal, an American who’s been living in Canada for 14 years. “Aside from the whole badge thing, you have to look at the products coming out, not the hype,” added fellow panel member Roger Chabra, a partner at Rho Canada Ventures. And just because there are more incubators and accelerators in Canada doesn’t automatically mean the success rate for Canadian startups will also increase, said panelist Robin Axon, general partner at Mantella Venture Partners. It just means more startups are entering and graduating from such programs, he said. “You haven’t really built a business” just by graduating from a program, Axon said. Many Canadian startups dream of being accepted into a Silicon Valley program like Y Combinator, and many Canadian tech industry leaders aspire to build an incubator and accelerator ecosystem here like California’s. If Canada’s incubator and accelerator market gets overcrowded like Silicon Valley’s, however, it won’t be good for Canadian startups in the long run, Chabra said. Are Canadian startups already beginning to get lost in the incubator crowd or fall through the accelerator cracks? From where Lee Bremer is sitting, yes. He took to the audience microphone at Thursday’s event to decry the lack of seed funding or support for companies that aren’t in the hottest niches like mobile apps for communications or social networking. Although his startup, Toronto-based Quinzee, does make a mobile app, it’s aimed at the cleantech market and needs the involvement of utility companies: the app runs smart meter data through analytics so property owners can track their energy use on the go. Despite talking to a few incubators and accelerators, Quinzee hasn’t yet met the criteria for any. And although the MaRS Cleantech Fund (a $30-million fund announced in March and created by Toronto’s MaRS Discovery District and private sector partners) targets seed financing for cleantech firms, Bremer said Quinzee doesn’t qualify because it’s not close enough to the commercialization stage. In an interview after the CVCA event, Bremer and his Quinzee co-founder Faizal Karmali expressed frustration with what they perceive as a bias among Canadian incubators, accelerators and the VCs often tied to them: favoritism towards startups with founders in their 20s who have more tech knowledge than business experience. Quinzee’s co-founders, who are a decade or more older than the 20-somethings dominatingstartup headlines, are in the opposite boat, they said. “Accelerators are great if you’re a coder and need a desk to sit at and business mentoring,” Karmali said. Phil Noelting, who also attended the event, is more positive about Canada’s incubator and accelerator scene so far. In 2010 his startup Qwalify, which makes a hiring tool widget for recruiters, entered the Accelerator Centre, an incubator in Waterloo, Ont. that’s partly government funded and allows startups to reside there for two or three years. Panelist Segal, whose own company never took the accelerator or incubator route, bluntly made a case for skipping the whole cohort experience entirely, noting that Microsoft Corp. founders Bill Gates and Paul Allen are both college dropouts.